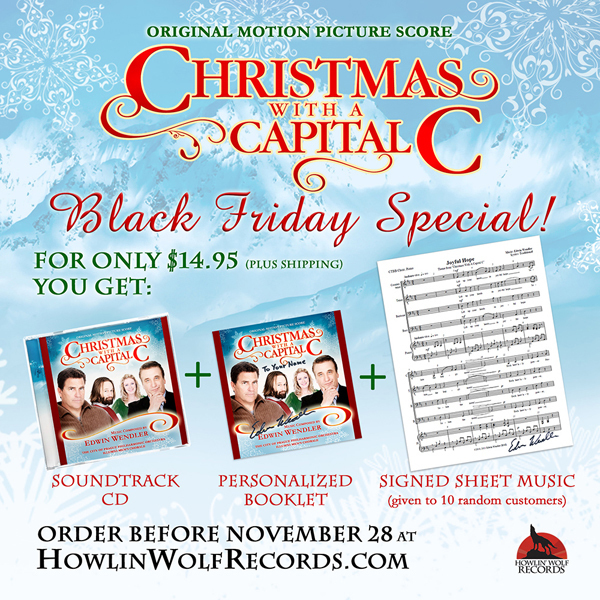 "Christmas With A Capital C"
Limited to "500" Copies Order now to receive a personalized CD. For the first time a soundtrack label will offer a personalized CD booklet with your name on it! If you order before Tuesday November 28th at midnight (PST) you will receive an extra booklet personalized with your name on it! ALSO, 10 random customers who buy this CD before Tuesday November 28th at midnight will also receive a signed sheet music page from the composer. With all the great releases our favorite labels are giving us this time of year, there is one thing missing ... a Christmas themed album full of sleigh bells, memorable themes and great old school film score writing that we all miss so very much. Edwin was asked to write a melodic score that tugs at the heart strings and was given an orchestra and not just any orchestra, The City Of Prague Philharmonic Orchestra. Along with this great orchestra, Edwin also composed two new GORGEOUS and moving songs that were performed by the Illumni Men's Chorale in Seattle. Many will never have seen this film nor heard the score, that's fine. GO LISTEN TO THE AUDIO SAMPLES, trust us! Act Now... like all specials, this one too will come to an end!